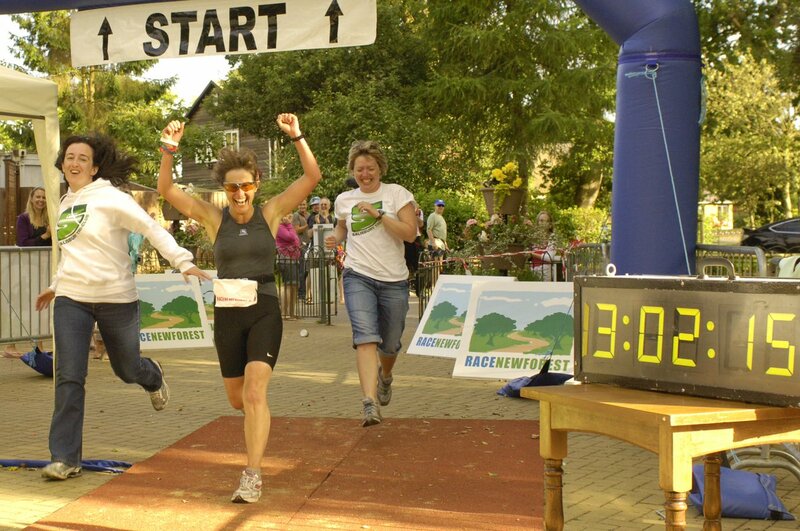 RACENEWFOREST is run by Joanne and Richard Iles who between them have too many years first hand experience of competing in Triathlon, Duathlon, and running races of all distances and sizes, around the world. During this time we are all lucky enough to have been living and working in the beautiful New Forest in Southern England – an ideal area for cyclists and runners with quiet roads, miles of cross country trails, and the odd, surprisingly demanding, little hills! Our events draw on our experiences of racing all round the world:- races for athletes by athletes. Designed for for athletes who value camararderie and friendliness, whilst doing something challenging surrounded by the lovely scenery of the courses. Put simply, they are designed to be the kind of events we would like to be taking part in ourselves. As a very small team we are able to personally take charge of all the logistics from scheduling to putting out and checking all the signage so we know it is as we want it to be! We pledge to give 100% of our effort to ensure each and every race is perfectly "organised": a value reflected in the testimonials we receive. The courses are routes we personally ride/run regularly and are designed to be challenging and scenic: the New Forest is a beautiful and testing place to race but the roads are often narrow and the courses are all on open roads. Highway regs apply and we have to include the occasional compulsory stop at major junctions / right turns to keep you safe! Our courses tend not to be of "standard" distances....the configuration of the roads limits this. In any case you're unlikely to set a PB on rolling roads where there's every possibility you'll get held up by a herd of ponies (or cows, donkeys, sheep.........or sometimes - if you're really lucky- piglets!!) However, if you value the experience of taking part in well organised (extremely) challenging events in a fantastic environment and view the wildlife as an enhancement rather than an impediment to your pursuit of maximum velocity you're in tune with us.....and the many athletes who come back time and time again to test themselves here in the Forest. We try to keep our run routes off road and to include as many hills as possible (or so I'm told by competitors!!) As such it's not always possible to have accurate mile markers etc although we try and get a few out even if just to reassure you that you are getting closer to the finish line. But those views!!!!!! It's also important to point out that our events at Bucklers Hard.....(possibly the most scenic Transition in the country......if not the world!!) take place in a tidal river. We endeavour to time the races for periods of "slack" water but planning as far ahead as we do it's not a precise science so you do need to be able to swim to a reasonable standard. That said, I've seen many really poor swimmers comfortably inside our cut-off times!!! In any outdoor sport (particularly one that involves use of public highways) there are occasions (fortunately very infrequent) when things have to be changed last minute to keep you safe or to ensure an event can go on: weather conditions, flooding, road closures etc. You can be sure that when you enter one of our events we'll be giving you 100% to ensure you always get the best day possible under any set of circumstances.....but it needs to be understood there will always be some things that despite our skills, preparation, planning and effort that we can not control!! One small note on prizes. Our major concern is that every athlete gets the best day out possible whether right at the front or right at the back...no difference. At the front end of the field, however, as competitive athletes ourselves we believe that the prizes we award should be meaningful. Given the relatively small fields in a number of our events this means we will aggregate age groups if there is only a handful of competitors entered in each. Hopefully that gives a pretty good summary of who we are, what we do and how we try to deliver it:- if it's striking a chord then get signed up........if you're going to put yourself through hell, you might as well do it somewhere nice!!! Thanks to all at @RaceNewForest for a great race yesterday. Excellent organisation - superb all round. I'll be back! Best/most picturesque location I've ever done a tri (better than Wimbleball). Finishing and cheering people on in the village is amazing, you are encouraged to go to the pub after and most do. Loads of parking, loads of portaloos, not a crazily crowded start = zero stress on races day. Fantastic marshals and organisers, if you have any questions you can literally ask the race director face to face and he's a top man. You are not made to feel like a disposable customer, there is a genuine care and interest that you have an enjoyable event from all the marshals. In short: best organised race I've ever done"
"Thanks for putting on another great race today guys. You are the best, oh and must not forget the fantastically awesome marshals. (Must say that or Sue will beat me!)" "I agree - thanks for all your hard work and the marshalls were excellent and so full of enthusiasm!" "Thank you all for another great event. Hope you and your fantastic team of marshals have recovered!" "Terrific, as ever. It's a privilege to race in the New Forest with you guys." "You guys are great, no coincidence the two most enjoyable tris I've done have both been New Forest. Will be back! Best of luck with your own epic LEJOG challenge!" "Great race as always guys. Thank you for organising. See u next year"